Pope Francis is welcomed by Nour Essa, a Syrian refugee, as he arrives to attend a meeting at Roma Tre University in Rome, Italy, Feb. 17, 2017. Pope Francis, who was reunited Friday with one of the Syrian refugees he brought home with him from Lesbos, Greece, said migrants don't pose a danger to Europe's culture but rather a challenge for societies to grow. 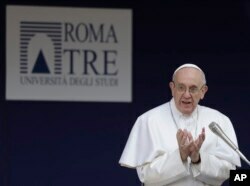 Francis made the comments during a visit to the Roma Tre University, one of the main public universities in the Italian capital. There, he met with Nour Essa, who along with her husband and child flew back to Rome with the pope after his April 16, 2016, trip to Lesbos. Since then, Essa has won a government scholarship to finish her biology studies at Roma Tre and has become something of an activist for refugee rights in her new country. Pope Francis delivers his speech during his visit at the Roma Tre University in Rome, Feb. 17, 2017. During a question-and-answer session in a courtyard at the university, Essa asked Francis about fears expressed by many Europeans that Syrians and Iraqi migrants threaten Europe's Christian culture. Francis responded by noting that his native Argentina is a country of immigrants, and that ending wars and poverty would trim migration flows. "Migration isn't a danger, it's a challenge to grow," he said, adding that European countries must not only welcome migrants but integrate them into society. "They bring to us a culture, a culture that is rich for us. And also they have to receive our culture and there has to be an exchange of cultures," he said. "Respect. And this removes fear." Essa and her family fled to Lesbos from Syria and lived in a refugee camp for a month until Francis visited. After meeting with refugees, Francis flew back to Rome with three Syrian families, all of them Muslim, in a tangible sign of solidarity. "Our lives changed in a day thanks to you," Essa told Francis on Friday. The Sant'Egidio community, a Catholic charity, took responsibility for settling the dozen refugees, getting the children enrolled in school and finding housing, jobs and language classes for the parents. Essa recently was on hand at Rome's airport to welcome a group of 41 Syrian refugees brought to Italy by a joint program of Sant'Egidio and a Protestant church that organizes "humanitarian corridors" for migrants to legally migrate to Europe. There, Essa told reporters that refugees aren't terrorists. "We are refugees fleeing from war," she said. During Friday's event, Essa and Francis chatted warmly with one another. She smiled when Francis recalled that in Lesbos the refugee families — already aboard his plane for the trip to Rome — didn't want to come back down the stairs to the tarmac to bid a formal farewell to Greek authorities who had accompanied Francis to his aircraft. "They didn't want to get off," Francis said. "They were afraid they'd have to stay."